Join the UCI Libraries for the opening of its 50th Anniversary exhibit titled Ready, Set, ZOT! : UCI Athletics Since ’65, on Monday, Sept. 28, at 5:30 p.m. at UCI Student Center, Crystal Cove Auditorium and Langson Library, Holden Room. Ready, Set, ZOT! documents the dedication to excellence, commitment to success, and perseverance in the face of adversity that built today’s UCI ’Eater Nation. The exhibit will chronicle UCI sports history, and tell the story of how a young campus achieved such impressive results through rare photographs, archival documents and items from the UCI Athletics Department. Visitors will experience the inspiring victories, improbable come-backs, heart-breaking losses, conference and national championships, and the incredible school spirit that made it all possible. Opening night panel speakers include Russell Turner, UCI Men’s Basketball head coach; Julie Brooks, UCI Women’s Golf head coach; Dan Klatt, UCI Women’s Water Polo head coach; and Mike Gillespie, UCI Men’s Baseball head coach. The event will be moderated by Mike O’Sullivan, UCI Athletics sportscaster. 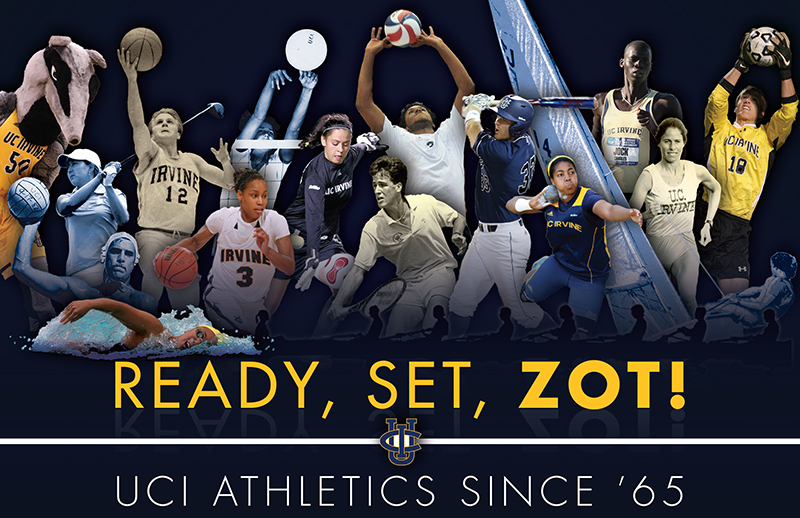 Ready, Set, ZOT! will be on display through April 2016 in the Langson Library Muriel Ansley Reynolds Gallery during regular library hours.